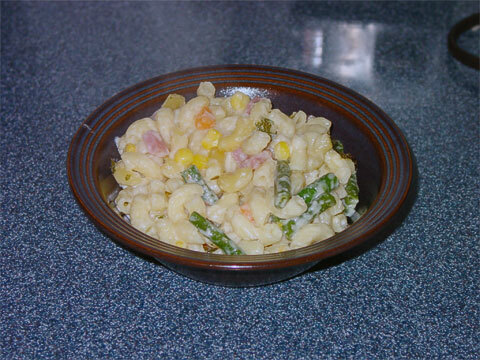 Macaroni and Cheese Casserole is a favorite of both of my sons. My version has vegetables and sometimes I also add ham. Cook pasta according to instructions and drain. Preheat to 350°F. After water has started heating, begin the sauce. Melt butter in a skillet over medium to medium-high heat. If using mushrooms, cook in butter until softened. When butter is just starting to brown, whisk in flour, making sure it is completely coated with the butter. Let cook for a couple minutes until it starts to brown slightly. Whisk in milk, making sure no lumps remain. Continue cooking and whisking until sauce has thickened. Season with salt, pepper, and a dash of nutmeg. Add cheese, stirring until completely melted and mixed. Stir in vegetables and ham. Remove from heat. After pasta has drained, combine well with sauce. Either leave in the pasta pot or pour into a 9"x13" baking dish. Bake for about 20 minutes.